Joe McNally is an internationally acclaimed, award-winning photographer whose career has spanned over 30 years and included assignments in over 70 countries. Bridging the world between photojournalism and advertising, he has shot cover stories for TIME, Newsweek, Fortune, New York, Entertainment Weekly, The New York Times Sunday Magazine, Men's Journal, Sports Illustrated, and National Geographic. The job of a light modifier is to take a raw blast of light and shape it, contain it, and make it work for the kind of shot you are trying to create. Join Joe McNally for a clinical look at a range of light shaping tools in a sterile studio environment to help inform your ability to extrapolate out their performance into the real world. Starting with a series of light modifiers for small flash, Joe demonstrates how each one works while using the same subject, and catalogs the effect each light shaping tool has on the light source and the subject. From there Joe moves on to analyze a series of light modifiers designed for studio strobes in the same circumstances. When the analysis is complete it is time to move the lights, light shaping tools, and subject out into a variety of real world locations to put what has been learned into practice. Do you file away fun photo shoot ideas in your head? Join Joe McNally on location at Weeki Wachee Springs where he gets to finally realize a fantastic photo shoot idea he's had in mind for a long time. In true Joe McNally fashion he pulls out all the stops to ensure he has the lighting, the crew, and the location to pull off his vision. From preparations the day before to the early morning arrival time, and through the end of the shoot, Joe talks through his concept, the setup, and all of the problems that need to be solved to pull off the one frame he's trying to create. Putting everything underwater leaves no room for error and lot's of obstacles to overcome, and you get a front row seat. Join Joe McNally for a series of on-location shoots as he demonstrates different techniques for revealing people and objects in motion. From capturing an aerial dancer on a flowing silk to showing the motion of flowing fabric and hair, Joe steps you through the process of pulling all of the pieces together and then modifying them on the fly to meet the real world conditions you will encounter. Joe uses a combination of ambient light, speedlights, continuous hot lights, and strobe to create different effects that can be used to show blur or stop all motion in its tracks. Join Joe McNally for a day of on-location shooting as he demonstrates different techniques for showing the world in motion. From capturing a moving cyclist on a wooded trail to showing the motion of flowing fabric and hair to creating a complex scene with a moving ambulance, Joe steps you through the process of pulling all of the pieces together and then modifying them on the fly to meet real world conditions. Every shoot has its challenges and you get a front row seat watching a master draw on years of experience to make the adjustments needed to get the shot. Join Joe and Scott for an evening of no-holds-barred portfolio critiques, stories, and laughs. Joe graciously provides his expert, constructive insights to help beginners and experienced shooters alike improve their portfolio. More experienced photographers often get to a point where takeaways and suggestions are rare. Joe's unique way of seeing into photographs, coupled with his years of experience, and absolutely entertaining delivery style, makes this live night at the Tampa Improv a must watch class for any photographer. 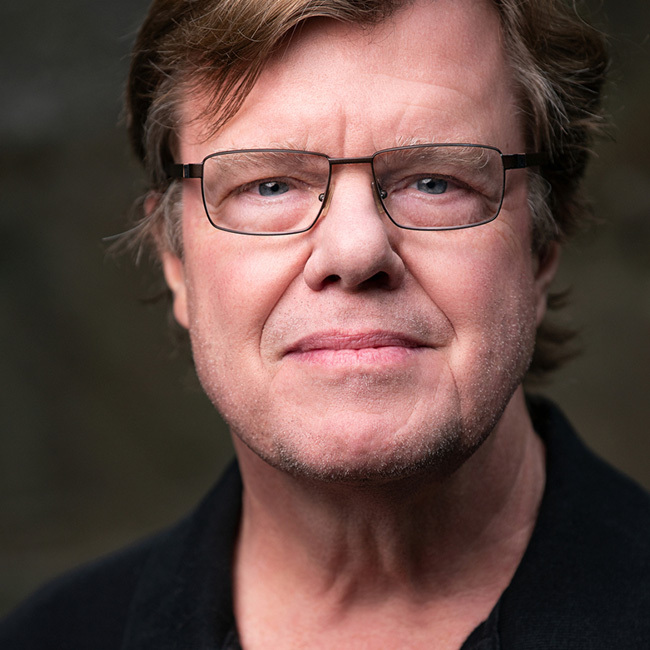 Join Mia McCormick as she sits down with Joe McNally, an internationally acclaimed photographer, for an inspirational hour of conversation that spans Joe's 30 year career. Joe has always strived to use his photographic vision to convey the emotionality and visceral impact of his experiences to the viewers of his work. In this interview you'll hear the story of how Joe got started in photography, gain insight into what he's thinking while on assignment, learn the back stories behind many of his most well known photographs, discover what drives him to give so much back to the photographic community, and so much more! Don't let bad weather ruin your next photo shoot. Learn how to make great photographs with Joe McNally, internationally acclaimed photographer, as he calls upon his years of on-location experience to give you the tips and tricks you need to get the job done in a variety of locations and uncooperative weather. Joe starts by introducing the gear he takes with him on location and then walks you through his process of making the most of whatever nature has in store at each unique destination. What do you get when you team up world class dancers with internationally acclaimed photographer Joe McNally? In a word, brilliance! Join Joe as he employs a series of lighting setups, from big flash to small, that demonstrate different ways of capturing the grace and beauty of these dancers in flight. From soft light to strong, Joe dives deep into the thinking that goes into each lighting decision as he grapples with the challenges each situation presents. This class is all about matching a light to a move, where you start out with the set as an empty box that you fill with your creativity and imagination. As the dancers work through different moves Joe shows you how to light them with both studio strobes and speedlights to achieve a variety of looks, all the while sharing the tips, techniques, and tricks he's learned over his impressive 30 year career. Spend some time with Scott Kelby and crew as they share a day in the life of professional photographer Joe McNally (Time, LIFE, Sports Illustrated, National Geographic, etc.). Start in Joe's studio as they pack for the day's shoot and travel with Joe and Scott to a photo shoot in NYC. You'll get an up-close insight on commercial photography - the kind that a photographer reveals when having a conversation with a good friend - and learn not only the "how" of a job, but also the "why" from choice of subject to motivation. Plus, if you've ever seen Joe and Scott interact before, you know you're going to enjoy yourself and laugh a little along the way. Joe McNally takes his amazing lighting techniques to the kinds of locations that clients ask for in sports, editorial, or commercial photography: outside on an unseasonably chilly Florida day, inside a cramped gym, and down in a mucky swamp. There, he creates some stunning athletic portraits that show you how to manipulate light and capture what can be asked of you in real-life working situations. In this course, Joe McNally brings viewers along on a day of corporate photography. During this day-long shoot, Joe gives a series of examples of executive portraits and boardroom setups. During these lessons, Joe talks about finding solutions to portraiture. He discusses lighting set ups, how he manages people, how he tackles lighting problems, and how he keeps the clients happy, with an emphasis on making them and their brand look good. If learning advanced flash techniques from a legendary photographer gets you excited, then get ready for a serious adrenaline boost! Join Joe McNally as he teaches advanced lighting setups and camera flash techniques for creating spectacular multiple exposures of the same image. From pros to amateurs (and even kids), sports portrait photography has never been more popular. Join Joe McNally as he walks you through the lighting setups for several indoor sports portraits. You'll get to watch over his shoulder as he mixes the lighting with the indoor environment to capture the key athletic moments. As Joe McNally says, an Environmental Portrait is a Face in a Place. The setting is just as important as the subject, and the goal is to merge those two elements together in front of the camera. Join Joe as he takes viewers on three different shoots and tries to find the right mix of lighting, detail, and atmosphere to tell the story. The Elinchrom Quadra lighting system is a frontier unit, meaning that it goes beyond the power of a small flash while still being lighter and more portable than a big flash. Photographer Joe McNally takes the Quadra system out into the field to multiple photo shoots and kicks the tires to see just what the unit is capable of. Professional photographer Joe McNally takes you on location to teach you how to transform and manipulate light to to create a scene, get the shot you want, and tell a story. Watch as he transforms a dark motel room, creates a dramatic and creepy scene, and uses high-speed sync for some fast action shots. This class is perfect for the intermediate or advanced looking to manipulate light to tell a story. Ever been told to work lighter, faster, better and with less gear? Well Joe McNally's latest class dives right in and shows you what's possible with just one single light. You'll learn how to take studio-quality lighting on location. When you're done, you'll be able to take one light and make it look like you had so much more at your disposal. Join Joe McNally as he explores the creative possibilities of Nikon's new SB-900 flash, and teaches you how to get professional results with your photography each and every time. Learn to take full advantage of the SB-900's portability, versatility, and advanced features and settings. Photographer Joe McNally vocalizes his thought process as he lights and shoots a mix of indoor and outdoor locations in New Mexico. Photographer Joe McNally has some advice on getting through some of the common obstacles that get in the way when working in corporate photography. Famed photographer Joe McNally demonstrates some more advanced techniques using flashes. Professional photographer Joe McNally shares his insight on using hot shoe flashes offers tips on small, quick adjustments that can be made while on set. This class is perfect for an intermediate who wants to learn quick tricks to use flash and adjust light. In this course we'll examine various light shaping tools and how to speak with light. We'll investigate how these light shaping tools can produce dramatic and different portrait solutions.